After students posted on social media about a man wearing a Confederate flag sweatshirt in American University’s dining hall Thursday night, the University has released a statement regarding the incident. Fanta Aw, the University’s vice president of campus life and inclusive excellence, sent a memo to students Friday afternoon acknowledging that a man wearing a Confederate flag hoodie entered and dined in the Terrace Dining Room last night. The theme of the evening in TDR was “Spanish Night,” a reservation-only event for students. Aw did not identify the man wearing the sweatshirt by name, or say whether he was a student at AU. She added that administrators will communicate with students as they “continue to understand” what happened. The University’s response to the incident was prompted by a public Facebook post that was shared by several students on Thursday night. AU student Francis Hernandez wrote that the man in the sweatshirt made her “anxious” to the point that she could no longer eat or enjoy her meal in the dining hall. Hernandez, who shared three photos of the man in her post, declined to comment further to The Eagle. AU’s NAACP chapter also declined to comment for this story. 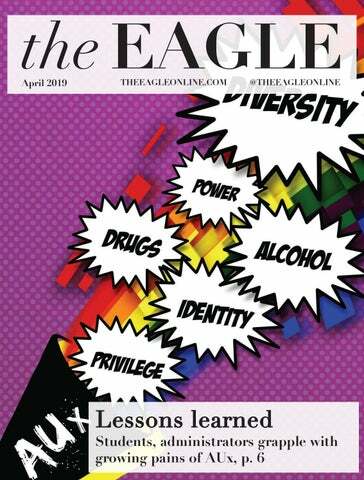 The University is no stranger to racist incidents on campus in the past several years. In September 2017, an unidentified man posted Confederate flag posters with cotton attached to them across campus. A suspect was never identified and no one was arrested. In May of that year, bananas were hung from string tied in the shape of nooses on the day that Taylor Dumpson, Student Government’s first black female president, took office. It was later investigated as a hate crime by the FBI. Other students shared their outrage about the incident on social media. Kelvin Riddick, a freshman at AU who wasn't in TDR at the time of the incident, said his “heart sank” when he saw pictures of the man wearing the hoodie.